Bioenergy is energy that comes from biological or organic sources. It is a renewable source of energy. Bioenergy is also the same as biofuel. Bioenergy comes from the processing or direct use of organic material called biomass. This biomass comes from plant and animal matter. Dead trees, branches, tree stumps, yard, animal waste, and even municipal solid waste are sources of biomass. In the case of old wood, simply burning it for heat is an example of bioenergy at work. As of 2010, 35 gigawatts (GW) of electrical energy has been produced using bioenergy, out of this, 7GW was produced in the United States. 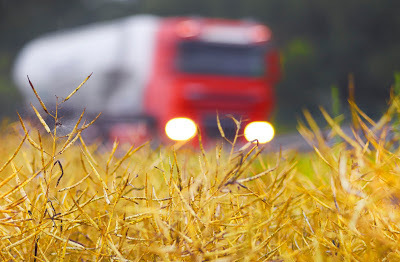 Biofuel global production for that year reached 105 billion liters (28 billion gallons) and accounted for 2.7% of the world's fuels for road transport. Since biomass is dependent on growing energy crops such as rapeseed, sugarcane, and palm oil, it uses the same resources (and sometimes even the same crops) needed for food. With the increasing demand for biomass for bioenergy production, conflicts over land use becoming a controversial subject. With food shortage already a problem, the United Nations projected that in 20 years time, food demand would increase 50% from what it is today. Since land isn't increasing, this increase in food demand will be a burden on the existing agricultural land. Much more so, since biomass also depend on land to be produced. With this in mind, a team of eleven scientists from seven European countries and the USA discussed and identified environmental, economic and social constraints but also options for efficient use of surplus land for bioenergy. The study provides a scientific background in support of a reassessment of land available for bioenergy feedstock production. Their findings were published in the open access journal BioRisk. It has been suggested that food production and bioenergy production be segregated into agricultural land and surplus land. The confusion lies in how to categorize what land is used for what kind of crop. Certainly, established agricultural land will still be dedicated for food use but with the growing demand for more food (which will require more land), how will surplus land be divided? 'We still have limited understanding of how much land is truly surplus and suitable for energy crop production' said Dr Dauber, the lead author of the study, 'because constraints arising from environmental and socio-economic implications of bioenergy development in those areas are often not accounted for in assessments of land availability'. The authors suggest a thorough reassessment of land availability for bioenergy production by clarifying the terminology of surplus land and taking both constraints and options for efficient and sustainable bioenergy-land use into account. Policy recommendations for resolving conflicting land-use demands are provided. In Dr Daubers opinion, 'factoring in the constraints, combined with creativity in utilizing the options provided by the novel cropping systems, would lead to a more sustainable and efficient development of the bioenergy sector'. Food vs. fuel: Is there surplus land for bioenergy?